When you want a topic you care about to be high on the agenda, it’s fantastic when someone high profile takes interest. 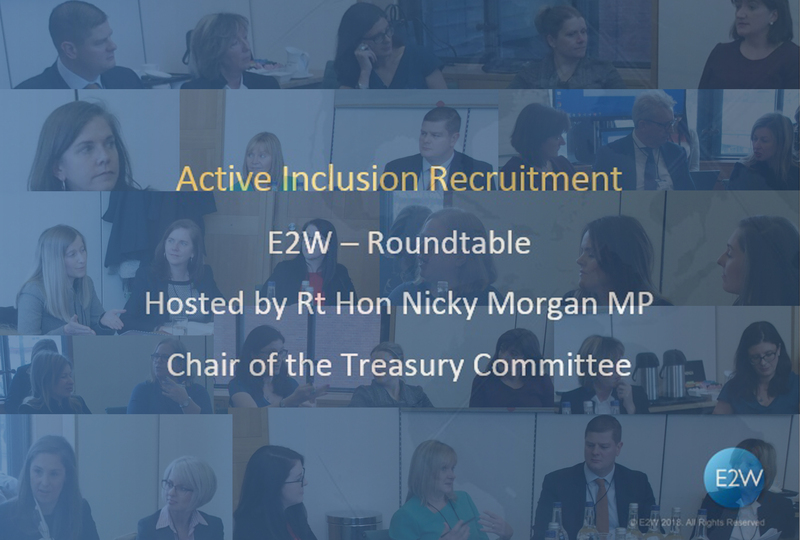 As chair of the Treasury Select Committee (the first female chair), Nicky Morgan MP initiated an inquiry into Women in Finance, to which E2W submitted evidence. Our evidence focussed on best practice in recruitment – something we, and the report recognised as a key imperative to get right, particularly in senior roles, if we are going to address the gender gap in the industry. As a result, we met Nicky and she said she’d like to learn more from us, our members and those in the industry driving change. On January 22, we delivered on that by chairing a round table discussion on active inclusion recruitment practices in financial services, focussing on how firms are adapting their recruitment processes to attract and recruit women into senior roles. Nicky was the host at Portcullis House where we welcomed E2W members and our recruitment partners to share their experiences, recommendations and best practices. 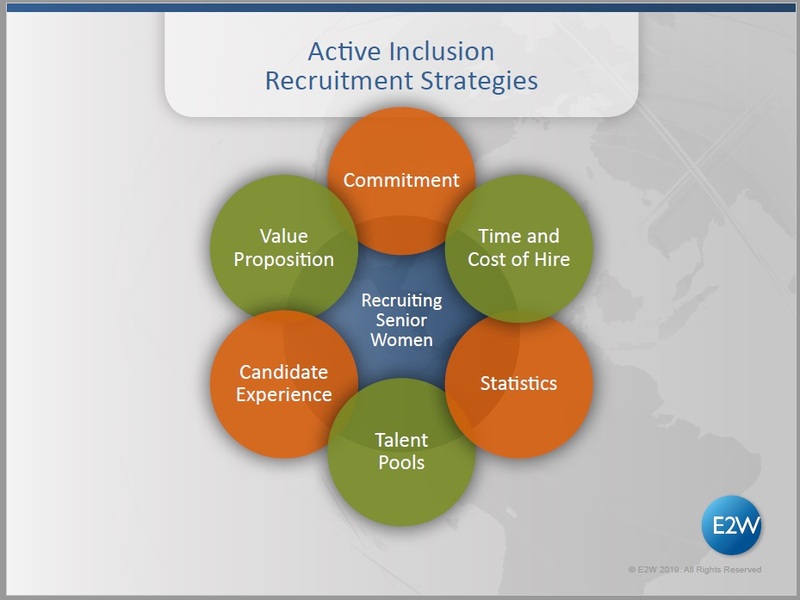 We used E2W’s Six Pillars of Diversity Recruitment as the structure for the conversation. This is a high level summary of the event. In future weeks we will publish more detailed insight into best practice in each of the six pillars. Lynn Maxwell, who has led global structured finance teams for global banks, discussed the need to ensure middle management are engaged. Unless the commitment at the top is delegated and middle management are given the responsibility, resources and rewards, they will not change behaviours. Leaders have recognised that however much you tweak the traditional ‘time and cost of hire’ prioritised recruitment strategies, they will still turn up the same high proportion of male candidates. Leaders are making finding female candidates a priority and are investing in working with external diversity recruitment partners early in the process. Similar strategies have been put in place at Deutsche Bank when it comes to their ‘evergreen roles’. Sarah Chapman, director, Global Credit Trading Management at Deutsche Bank explained that notable success has been achieved by identifying roles at director and MD level where recruitment teams are actively encouraged to wait until they find suitable female candidates. This is an area that needs some improvement. Too many firms are simply targeting recruitment teams / suppliers to come up with diverse candidate lists. This can be counterproductive and lead to unnecessary costs and token candidates being introduced into the system. Leaders should set key performance indicators or targets at all key stages of the process from candidate attraction to candidate acceptance. To kick off the discussion on statistics, we asked how many of those round the table felt that they had been invited to apply for a role by a recruitment company (at senior level) just to make up the female numbers and sadly the majority felt they had. As hiring managers, examples were given on how they often received candidate short lists where it was obvious the recruitment teams had added a few candidates with diversity characteristics simply to make targets. At Janus Henderson, Head of Recruitment Charlie Brooks and his team demonstrate the diversity of the team on paper. Some managers may think they’re doing well when it comes to gender diversity and that they’re as 100% bought-in as the CEO, but Charlie pointed out that they can feel differently when they see the numbers in black and white. This also gives the manager and Charlie’s team a frame of reference and helps them to shape clear goals. Leaders have recognised that traditional venues for sourcing candidates such as LinkedIn, eFinancial Careers and job boards don’t work well for attracting / finding female candidates. Leaders are looking for new pools where female candidates are in abundance. They ensure that their brand is in front of this pool so that they’re considered a great place for women to work. At Janus Henderson, Charlie Brooks, explained that they have been identifying where they lack talent pools. “We know that there’s a shortage of senior women in investment and IT.” To find more senior women for roles, Janus Henderson: Encourage employee referral - ask senior women to leverage their network both internally and externally to bring women who might be looking for a change of role to Janus Henderson’s attention and vice versa; Collaborate and leverage from relationships with firms like E2W who have invested in developing and nurturing talent pools. This is another area that the industry really needs to work on. Our survey of members’ experiences in the recruitment process showed some awful statistics. Leaders are beginning to look at how they define and implement experiences specifically to ensure that they give female candidates positive outcomes including wording of job specifications, training hiring managers and additional steps in the process. This strategy sparked many anecdotes of both good and bad experiences in the recruitment process but it’s clear that there are some advocates of positive candidate experiences out there. Heather Matson Global Head of Equity Analytics & European Head of Business Development at RBC shared with us her experience of interviewing with her current employer RBC Capital Markets: during the process, she was given the opportunity to meet other senior females who could share and explain the positive culture and working practices that make RBC a great place for women to work and flourish . We heard of some interviews where the lines of questioning had not been thought through and as a result, the questions were rather vague: “Tell me about yourself.” We had a great counter example to this from Louise King of Vanguard who recounted an interview she’d undergone where the male interviewer, said, “Firstly, let me tell you about me . I’ve got two children …”. This approach had removed the fear of discussing flexibility or admitting to being a parent. Suffice to say, the interview went well. To ensure that we are submitting our members as candidates to firms where they will be able to bring themselves to work, we ensure that all the institutions we work with can answer two simple questions: What makes this firm an attractive place to work and why will I succeed here? We are working with our clients to define, develop and promote their value propositions to our members and the wider community so it is always great to hear more examples. Heather Matson mentioned that her positive experience at RBC had impacted her behaviour both in how she approached her new role but also how she behaves when interviewing herself. Heather suggested that maybe firms need to be public about the good stuff that they do around recruiting women and gender diversity as a whole but also with regard to the non-pay incentives such as flexible working. The group agreed that greater transparency would help the industry. Tina Freed added that when companies have candidates in front of them, it should be a mutual process with the employer promoting themselves as a good place to work with the right culture as well as the candidate promoting their value. Flexible working policies, maternity/shared parental leave policies and the like should be more readily available for candidates. It was unanimously agreed that if companies lay out their environmental policies on their website, why don’t they share their value proposition for everyone to see too? Nicky summed up the event and stated that “Gender diversity needs to be deliberate. If it’s left to chance, it just won’t happen. It will only be fully achieved through deliberate action.” Nicky was also a strong proponent of transparency and financial institutions making their culture clearer up front – “Why couldn’t maternity policies be shown online?” she asked. There was a great deal for everyone concerned to take away from the discussion: many positives but also a clear indication that there is more to be done. Going forward, E2W will continue to expand on these pillars to provide further evidence to the government to ensure gender diversity is a deliberate action, to ensure best practice is implemented and that this subject remains at the forefront.